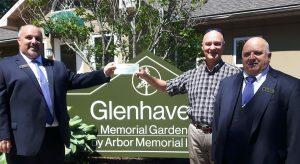 A big “thank you” to Dan Zemba and Denis Valente of Glenhaven Memorial Gardens who presented Tom Greening, our Executive Director, with a $1,000 cheque from the Arbor Memorial Foundation. They learned about Home Base Housing and wanted to help those who need it most! Pictured: Denis Valente – GMG, Tom Greening – HBH, Dan Zemba – GMG.